Don’t we all love giving gifts from our kitchen? My challenge, as I’ve mentioned in other articles, though, is to share things that not only taste good, but are healthy as well. Well, have I got an idea for you. This gem is not just tasty, it’s healthy, AND it’s easy to do (making it perfect for a last-minute gift). I’m talking soaked and dehydrated nuts. Lots of people give and get nuts for the holidays. But I guarantee they don’t get nuts that have been soaked and dehydrated on a low temperature. There’s very good reason, though, why this is the kind of nut you want to give or get. 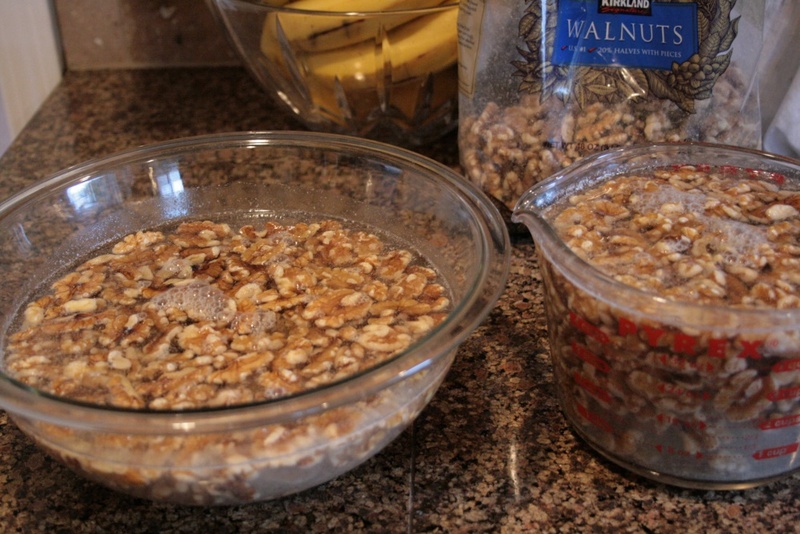 So just put the amount of nuts you want prepped in a bowl, cover with warm water, and let them sit overnight. The next day you drain them well, rinse them, and drain them again. From here you can either store them in an airtight container in the fridge (for up to 1 week), or lay them out on a cookie sheet or a dehydrator sheet and dehydrate them at a low temperature for approximately 6 hours. You want your temperature to be low so that your nuts retain their enzymes. High heat kills enzymes. So if dehydrating in your oven, set the temperature to the very lowest it will go. On a dehydrator, set the temperature to between 115°F and 120°F. Once your nuts are dry and crisp, let them cool for about an hour and then package them into your gift containers. When we do this I like to add a recipe that’s centered on nuts (spicy party nuts, chocolate and caramel nut clusters, no-bake nut balls, and so on). I also like to add a little note indicating the nuts were soaked and dehydrated for phytate removal. Watch how folks will be in awe of this extra step. 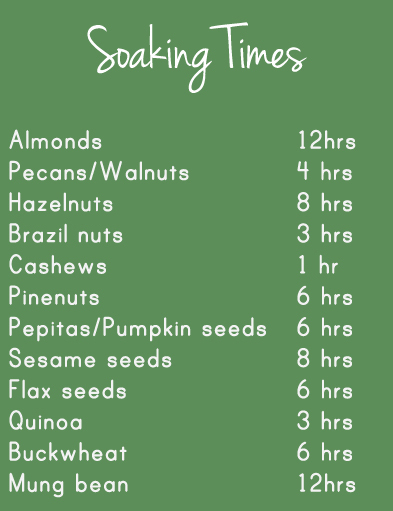 And here’s a chart on soaking times for basic nuts and seeds. Keep in mind that these times are suggestions. The only time I find hard and fast is the recommendation for cashews. They get slimy if soaked longer than an hour or two. Other than that, if you end up soaking the others longer than instructed, it’s no big deal. I just wouldn’t soak them for less than what is suggested. Now let’s move from healthy to just plain good for another last-minute gift idea. So yes, there’s nothing healthy about it, but it’s something folks don’t get every day. 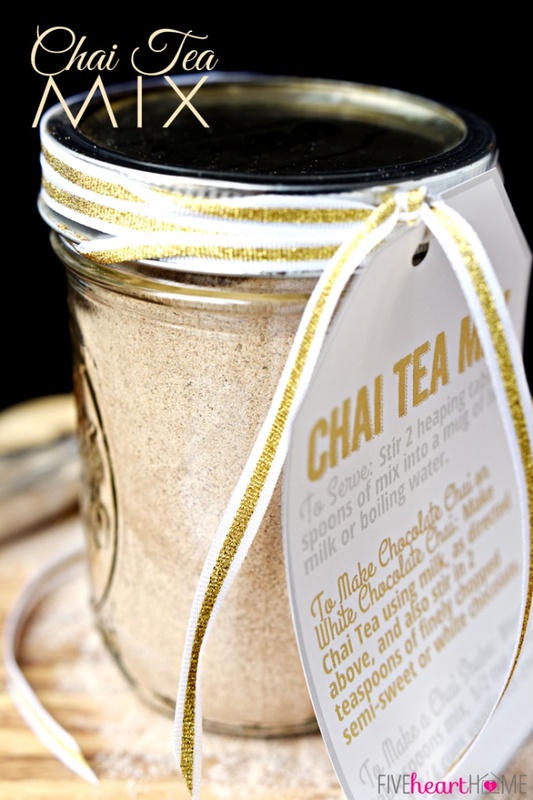 Have you ever made your own chai tea mix? It’s fast and easy. I found this suggestion on a lovely blog, Five Heart Home (www.fivehearthome.com). You can use the mix to whip up everything from lattes to milkshakes. We’ve even added a tablespoon of this mix to our morning oatmeal. Delicious! One thing: Be sure to include a tag with directions if you decide to gift this. And Merry Christmas! Combine spices, tea, sugar, milk powder, and creamers in a large food processor. Blend 1 to 2 minutes, or until mixture becomes a fine powder. Divide mix into gift jars. 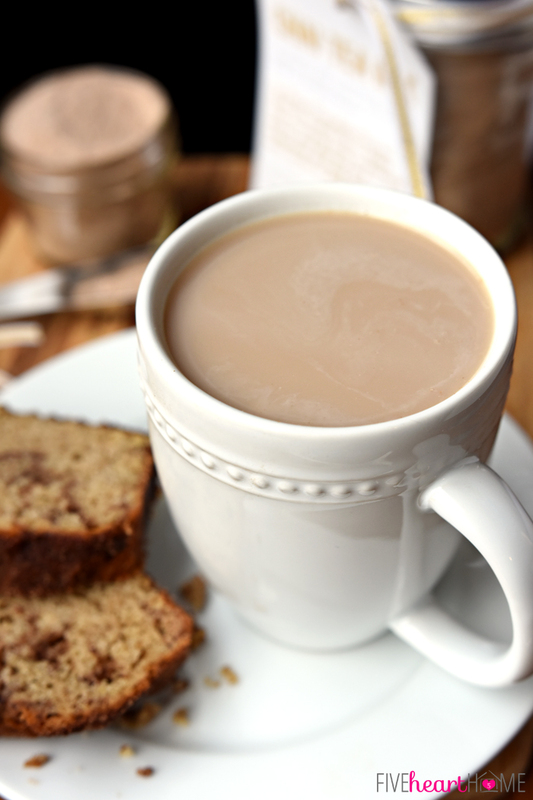 TO MAKE CHOCOLATE CHAI OR WHITE CHOCOLATE CHAI: Make Chai Tea using milk, as directed above, and also stir in 2 teaspoons of finely chopped semi-sweet or white chocolate. TO MAKE A CHAI SHAKE: Blend 2 tablespoons mix, 1/2 cup milk, and 1 3/4 cups vanilla ice cream in a blender. NOTE: You may also make mix in a blender instead of a food processor, but you will probably have to blend the ingredients in batches and then mix all of the powdered ingredients together in a bowl until thoroughly incorporated.